All cancellations require a 24 hour notice. Cancellations within 24 hour window will be charged credit card on file 50% of service. Please understand that our time is valuable and we do our best to accommodate all guests. Please be sure to keep this in mind when booking and do your best to notify us of any changes as soon as possible. Unopened products can be returned within 30 days for a full refund. Products that have been opened and used can also be returned within 30 days for a studio credit. The credit can be used toward future products or services. 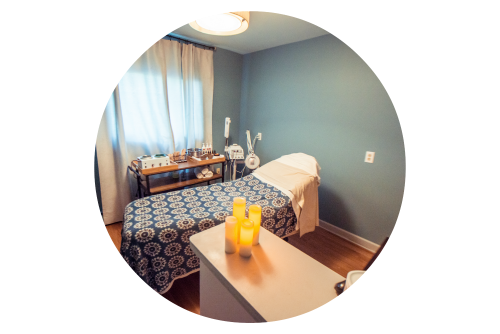 We will always try to accommodate a walk-in appointment, however our team is generally booked while they are in the studio so scheduling an appointment in advance is recommended. Payment is due at the end of your service. We welcome cash and all major credit cards. First time clients should try to arrive 15 minutes prior to their scheduled appointment to complete paperwork and get situated. Returning customers are also welcome to arrive 15 minutes before their appointment so we can get you started on time! We carry Tu’el Products. We have carefully selected these products lines with you in mind. They are natural and botanical skin care products that can be used on all skin types. They are vegan and free of harmful ingredients and fragrances so anything we put on your skin will be gentle, yet effective. Do I have to pre-book follow up appointments? You don’t have to pre-book, but we highly recommend it. Our time slots, especially evening and weekend appointments, fill up quickly and pre-booking will eStudio nsure you get a date and time that is convenient for you.